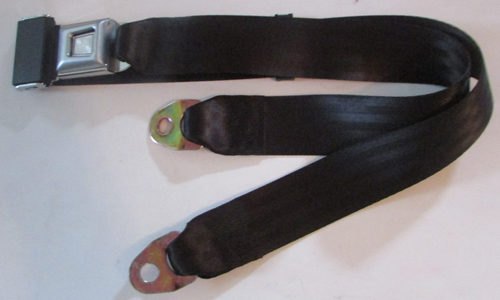 Seat belts for Chevrolet Camaro including 1970, 1971, 1972, 1973, 1974, 1975, 1976, 1977, 1978, 1979, 1980, 1981, 1982, 1983, 1984, 1985, 1986, 1987, 1988, 1989, 1990, 1991, 1992, 1993, 1994, 1995, 1996, 1997, 1998, 1999, 2000, 2001 and 2002 Camaro RS, LT, SS and Z28 models. Configurations include non retractable lap seat belts, retractable lap seat belts, retractable lap seat belts with shoulder harness and retrofit retractable lap seat belts with shoulder harness kits. Seat belt buckle options include an all metal with starburst logo on press area, GM logo on press area and an end release with red press. No guarantee is made if a webbing or a component color will match an existing seat belt or interior color. The seat belts and related hardware are new and manufactured to meet or exceed FMVSS (U.S. Federal Motor Vehicle Safety Standards) 209 and 302 with all of the seat belts manufactured or assembled in the USA. Available 60" long with a 20" long fixed(buckle) side and a 40" long adjustable(latch) side. Available 74" long with a 34" long fixed(buckle) side and a 40" long adjustable(latch) side. Can be ordered with any webbing color on sample page. MH2 standard mounting kitincludes bolts, washers, nuts and oversize reinforcing washers. 201K retrofit mounting kit which includes underbody reinforcing plates to add support to mounting points should be used when seat belts were not previously installed. 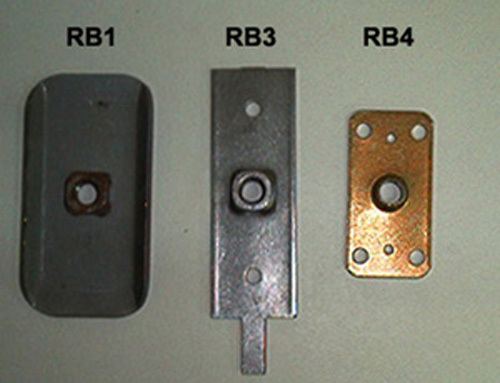 Standard mounting kit is not required when ordering a retrofit mounting kit. MH2 standard mounting kit includes bolts, washers, nuts and oversize reinforcing washers. 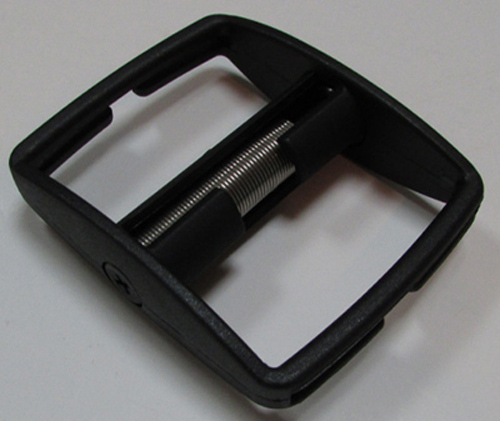 Buckle assembly is black with red press. Sold As Set. Includes the seat belts and conversion hardware for for driver and passenger plus installtion instructions. 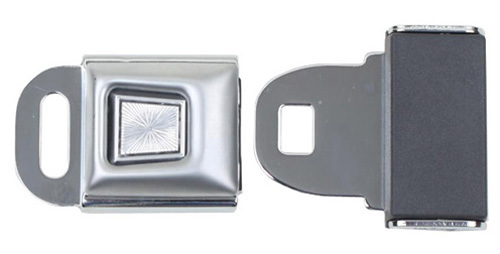 Buckle is all metal measuring 1 3/4" x 1 3/4" manufactured under GM reproduction license. Does not include an original style shoulder harness mount. Attaches using bracket included. Retractor cover, buckle sleevess and all plastic pieces are black. A stop button keeps the latch from sliding down the webbing when the seat belt is not in use. Can be ordered with any webbng color on sample page. See non retractable lap seat belt above for matching rear seat belts. **Prior to color indicates boots and buckle sleeves are color matched to webbing. Unless indicated boots and buckle sleeves and all plastic pieces are black. Sold As Set. Includes the seat belts for driver and passenger. Includes original equipment type shoulder strap mounting plates. 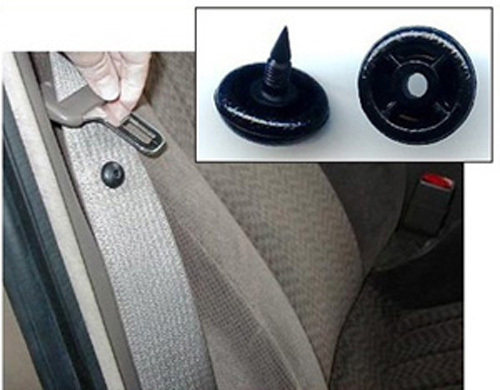 A web stop button keeps the latch from sliding down the webbing when seat belt is not in use. See non retractable lap seat belts above for matching rear seat belts. A web stop keeps the webbing from sliding down the webbing when seat belt is not in use. See matching retractable rear seat belts below or matching non retractable lap seat belts above. Sold As Set. Includes the seat belts for 2 persons/positions. Buckle is end release push button with red press. See non retractable end release lap seat belts above for matching rear seat belts. A web stop keeps the latch from sliding down the webbing when seat belt is not in use. Can be order with any webbing color on sample page. Keeps shoulder harness latch from sliding down webbing when belt is not in use. The seat belts do not need to be removed in order to install. 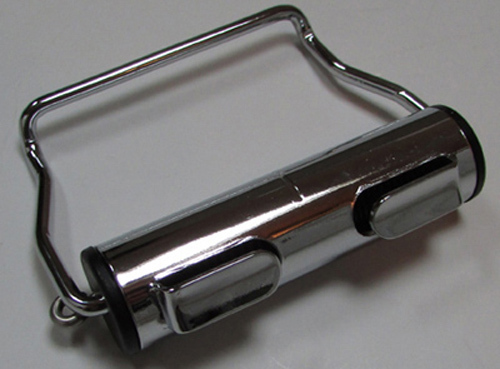 Does not alter the retractor safety features. RB1-1:Curved steel with attached weldnut. Measures 4 1/2" x 3". RB1: Same as RB1 except pair. RB3:Steel with attached weldnut. Measures 4 1/2"(not including tip) x 1 1/2". RB4:Measures 3" x 1 1/2". Accepts a 7/16th fine thread bolt.